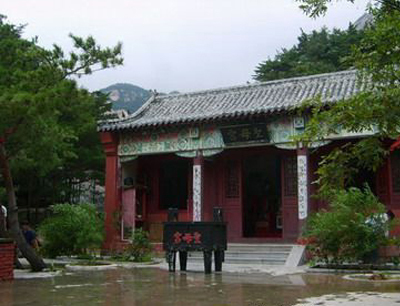 Leaving Kunyu Mountain Shaolin Martial Arts Academy now, after six months of studying here, it feels like leaving home. Originally I only intended to stay here for three months and when I arrived in April the food was not so good (it has got better), the training facilities were nearly nonexistent (and has got better) and a large section of the training area looked like a wild field (now a performance stage). The only reason I stayed here for as long as I could was to train with Bao Shifu. The training has been of a consistently high standard. Never once did I get bored or fed up with the training here. I can’t see how that is possible as I have constantly been learning new things, different skills that I can take with me always. So all I can say thank you to “the Shan” but specifically: Thank you Shifu. During the six months stay here, Chris participated in three competitions, and he got two gold medals and one silver medal. I had a really good time here, with training, living, learning. I have been studying Praying Mantis boxing here for one year. In this year, I have learnt a lot about the martial arts, because I had a very good master that really knows a lot. He told me that my basics were very good and spent a lot time to perfect all my forms. Not only martial arts l learned but also the way of a martial artist. I improved my personality as well. I really liked that we lived here in the mountains, because it is very nice, peaceful, and healthy. The school is a good as well, the rooms are nice, and they build a lot new ones as well. The school is improving, such as new dinning room, kitchen, training hall, boxing ring and so on. So thanks for everything they did and I will come back again! During one year stay here, Frank participated in two competitions, and he got two gold medals. 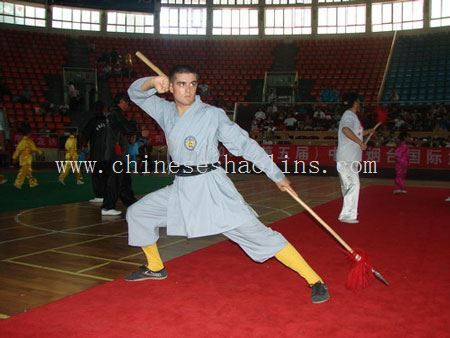 Kunyu Mountain Shaolin Martial Arts Academy is an incredible place to study many forms of martial arts. The academies historical and beautiful surroundings, accommodation and teaching staffs make for a brilliant learning atmosphere. I have stayed for 3 months and wish I could stay longer. There is no doubt in my mind that with the high level and standard of the teaching. I will be returning for another stay. My Master Wang has been an insightful and dedicated Master, whose time and training have helped my martial arts improve dramatically. His enthusiasm for kung fu and his firm, yet friendly manner have meant that I have very much enjoyed my stay at Kunyu mountain Shaolin Martial Arts Academy .I couldn’t have asked for a better teacher. I have been learning Shaolin kung fu for 3 months at Kunyu Mountain Shaolin Martial Arts Academy and have came to the end of my stay. As I look back over my time spent here I have so many happy memories. Memories of fun times with my master and classmates, and also hardships of training that I have overcome with time and effort. Master Wang is a kind-hearted, dedicated kung fu instructor, who has encouraged me to train to the best of my abilities and has helped my kung fu and fitness to improve greatly. I am humbled by his fighting abilities and am honored to have trained with him. He has spent countless days correcting and improving my kung fu. I am forever grateful to him. I am also grateful to the translators of Kunyu Mountain for their time and hard work. I thank Lois for immediately making me feel welcome and for her continued friendship thereafter. I thank Gary for being such a helpful, supportive person through my stay.? 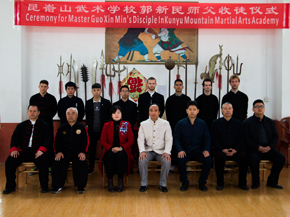 Also, I cannot forget to thank all of the staff here at Kunyu Mountain Shaolin Martial Arts Academy. The cleaners and kitchen staff are extremely hard working and are like the backbone of this academy. They are delightful people and are always smiling. With the experienced kung fu masters and friendly staff. I highly recommend Kunyu Mountain Shaolin Martial Arts Academy to anyone who is interested in learning martial arts in China. First I would like to say a huge thank you to Master Wang, you are a brilliant martial arts master and a great man. I not only appreciate the kung fu skills that you have taught me during my stay, but also your friendship. Also I would like to express my gratitude to Master Guo, thank you for your time and patience while teaching me Tai Chi, Baji Fist, Xingyi and Chi Kung. Thanks also for Master Du, for your help when Master Wang was away and your inspiration, and all the other masters at the academy. This has been the best 5 months, since I was a child I always wanted to study Shaolin kung fu in China in the mountains, so this experience has met and exceeded my dreams. I have met some great people who I considered to be great friends as well as kung fu brothers and sisters. I am truly going to miss Kunyu Mountain Shaolin Martial Arts Academy and the people here. During my stay I learnt 4 Shaolin Fist forms including Tiger Fist(which I am very greatful to Master Wang for teaching), Shaolin Staff, broadsword and spear. I also learnt a Baji Fist form, Yang style Tai Chi and Chen style Tai Chi, Xingyi basics, Chi Kung and Sanda(Chinese Kickboxing). I highly recommend this academy to anyone serious about learning martial arts the masters are amazing, you meet fun people, beautiful surroundings and if you work hard you will be amazed at how much you can learn. This academy is everything I imagined a Shaolin training camp to be. 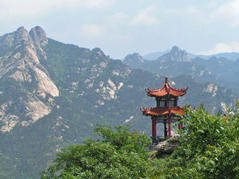 The location in Kunyu Mountains; the spiritual birth of Taoism makes the academy a special focus for students. The actual camp buildings themselves have a good feeling to them. The new training areas, conditioning poles, weights room and stage make this place a special place to train. Wang shifu has been the best master I’ve ever had and I feel privileged to have studied under him. He has the eyes and heart of a tiger and the dedication of his students. All students in “Wang Squad” are dedicated, strong and skilled Shaolin students and I am proud to be one of them in the academy. 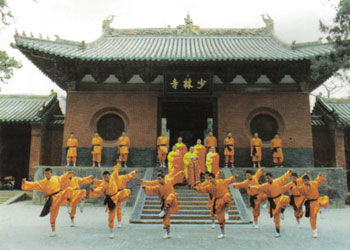 All the other shifus in the academy are masters in a full range of the Shaolin arts excellent choice of training to undertake. To achieve anything at grading here is very meaningful and a good representation of how hard a student must train to become a Shaolin master. I have total respect for all the masters here, they have skills and knowledge that takes many years to master, which is frequently demonstrated in classes. If I had more opportunity, or a drastic change in my life plan then I could see myself coming to Kunyu Mountain Shaolin Martial Arts Academy to become a full student for the rest of my life. The simplicity in the existence here is compelling and tempting. I hope that I can continue my level of fitness and knowledge so that when I return I can continue to impress Wang shifu. Much like many of the students I have talked to, I was unsure of what to expect when I arrived at the academy. But I was made to feel right at home by the translators, students and on-duty master; Wang shifu who turned out to be my Shaolin master. When I first arrived I found that the nights were cold and I had to sleep in a warm top in bed. However I found the rooms to be comfortable enough to get the rest I needed after training and prepare my body for the next day. Food aside, my stay here at the academy has been thoroughly enjoyable and has taught me a lot. I put most of this down to master Wang. In training he pushed me hard and has improved my fitness, strength, power and most importantly my confidence in myself. Before training began I had resonations about Sanda in particular, not having done anything similar beforehand; but after practicing the basics I began doing some semi-contact exercises so I could get used to knocks and bumps. After about 6 weeks I did some full contact exercises and really started to get into Sanda so much so that I participated in a sparring match with a fellow student, which I really enjoyed. I really wish I could stay longer to learn more from master because he has so much knowledge and experience. I am already planning my next visit and look forward to being in master class again. I am writing this because I am leaving the academy but this is only because I am running out of money. I would recommend this academy to anyone even if they have never done martial arts before. It is not all about the fighting, what I enjoyed was coming to learn the characteristics of other fighting styles and learning how to practice Qigong. I also found that it is impossible to stay here without knowing any Chinese because you always have to buy something necessary by yourselves at a marketplace. I only stayed here for two months and I feel like I achieved so much. The first few weeks were hard but after I got into the routine the days seemed to fly by. Training was hard but you knew you were working hard and I saw results within the first week. I was very proud to train under my master who helped me to further my understanding of soft martial arts and the development of qi as well as how to train myself to increase my power and flexibility. 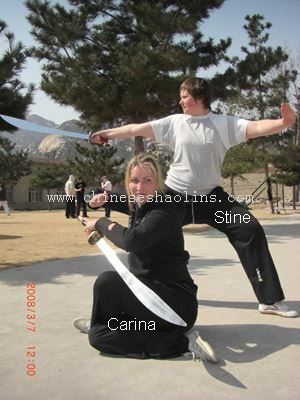 Master Guo was also kind enough to give me extra Baji classes so I could finish my form. When, not if, I return I will be excited to further study Baji and to understand its mixture of internal and external power. I look forward to studying under Master Guo again who introduced me to my new favorite martial arts. 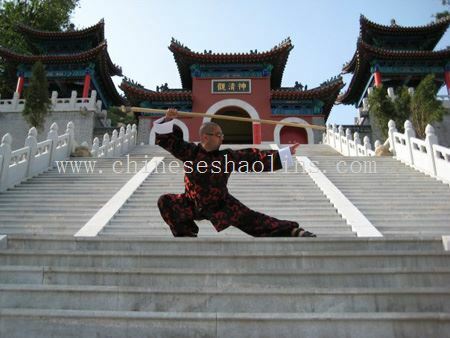 In my seven and a half months studying Shaolin kung fu under Master Bao, I have progressed a lot. I am fitter, more coordinated and defiantly more flexible. It has not always been easy, sometimes it is very frustrating but Bao Shifu has been very patient and understanding along the way ,obviously the masters can only teach you so much a lot of the progress comes down to you how much time you are willing to put in. the masters themselves are amazing when they move, grace and power as inspiration to watch. I am both happy and sad to be leaving. I have some excellent friends, and met people from all walks of life. many of whom I am sure I will see again. 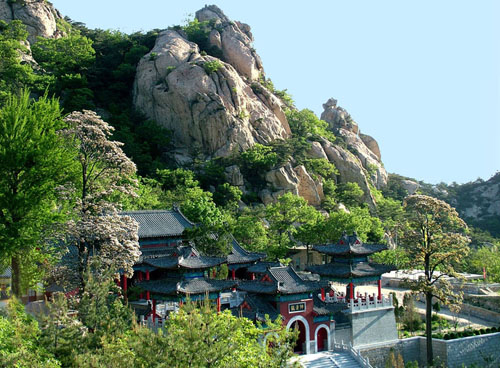 Kunyu mountain Shaolin Martial Arts Academy itself is surrounded by beautiful mountains, it looks fantastic covered in snow, but more beautiful when it in full bloom in summer. Training in the cold and hot of summer is a challenge but it gives the place more of a community that bringing people together. In summer after a very sweaty section there is nothing more refreshing than running down the road for a quick swim in the lake. 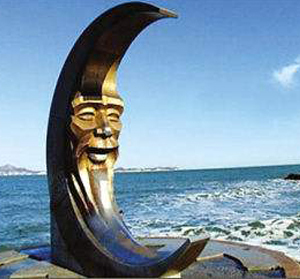 The translators are always happy and helpful, and make life a lot enjoyable. I would particularly like Lois for all her help, she is a life saver. And to the other Shaolin masters Wang Shifu and Du Shifu for always being friendly and willing to answer any questions. Of course there’s huge thank you owed to my master Bao Shifu for all his time and effort. I had an excellent times here, just watching what you can do was inspirational. I would like to return in the future and hopefully show you I have improved. Thank you for all you have taught me. I will defiantly continue to practice my Shaolin, this is just the start for me thank you very much. My stay here was good one. There was culture shock however the environment at the academy was peaceful. I enjoyed my training, it has given me a good foundation, and I appreciate everything the masters have taught me. I especially enjoyed the Baji and Chen-style Taichi, something I hope to carry on in my training. The translators were very nice and helpful. Also enjoyed the scenery and the town.. I give most of my thanks to master Guo. He’s a good natured man who is very patient and interesting, and I hope to see him when I return someday to the academy. I wish everyone here all the success they reserve. All my thanks! 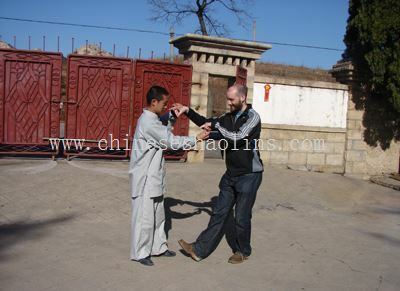 When I decided to go to China to train Shaolin kung fu, I thought it would be one of the hardest things I had to do in my life.? Especially because I wasn’t in a good shape when I came here. But it turned out quite easy actually. Not because it hasn’t been a lot of hard work, it has. Trust me, but what I mean is that at the same time I have had so much fun training, so in that way it made it easy. 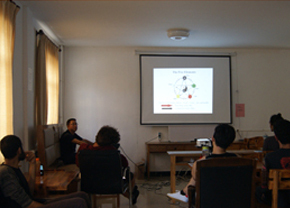 The training schedule is very variable, each day of week we do different things, so the training never get bored. My master, master Bao has been very patient with our classes, something is important if you are teaching people who hasn’t done any martial arts before. He is very skilled and I respect him very much. He is a good teacher. There is not really anything I have disliked about the academy, or, well, at the beginning I was not quite used to the Chinese food. It’s all right though, you get used to it. But anyway, I have enjoyed my stay here very much: The training, the people here. The whole experience has been great. And at last I would like to thank master Bao for all the things. He has taught me, and I wish him everything good in life. I hope to come back someday to learn more. The atmosphere of the academy is really good. Everybody gets long with everybody. When there are new people arrive at the academy, everybody helps to make them feel welcome. When I came here I need some time to get use to the daily life of the academy. It’s quite different from what I was use to from back in Norway, but after a couple of weeks everything felt normal. The same goes to training, you need some time to get your body used to this much training. The first couple of weeks where hard, but that goes for everybody. When we were not training indoors but outdoors. I think it took us longer to adjust because of the cold weather in Jan. To train in the cold was a big challenge. After adjusting the body to the cold and to training I felt that I could get more out of every training sessions and the motivation went up. I had done some martial arts before I came, and I felt that was a big benefit for me. I have learned more in this 3 month than I could if I didn’t. I like the schedule that says what we are going to do each day. Master Bao is a good at planning each session. So it fits the group his working with. For the time, I have been here it has suited my level very well. Good balance between the more physical hard sessions and the more technical sessions. My Master Bao also shows great enthusiasm in the lessons and for the martial art, and that is really motivated and you want to work hard. I am very please that I doing these three months have learned two weapon forms. That is something I always has wanted to do, and something I look forward to practicing more back home. Thank you for 3 magnificent months, and I will miss this place and I will miss the training session with the Master Bao. But hopefully I will be back some day. 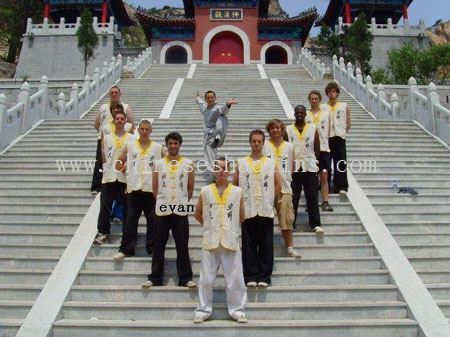 During my stay here in 2007 I studied Shaolin kung fu upon my return to the UK I did continue my training at the Shaolin Temple UK. This time I decided to study Mantis at Kunyu Mountain Shaolin Martial Arts Academy because there is a lot more internal practice involved. Something I had previously underestimated. 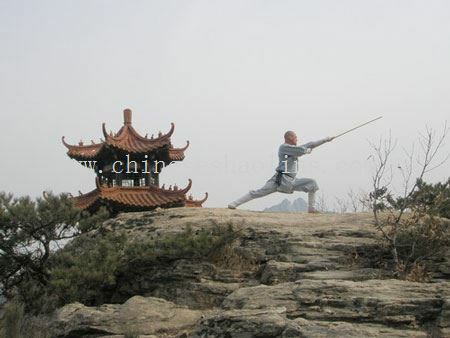 Having practiced Qigong in the UK, I realized that internal practices play an important role in martial arts. I have every intention of continuing with martial arts. I consider myself to be very fortunate to have had the opportunity of returning to the Academy. My second time has been more pleasant than the first. Now I can leave and have my life with commitment, humility and enthusiasm. Whatever I do, I hope I can make my Shaolin and Mantis masters both proud. I hope I can return a third time. 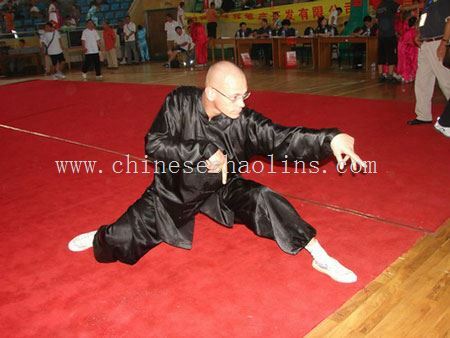 In July,2010,it is the third time for me to come here for another about three months kungfu training. 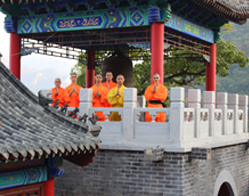 I attended the Kunyu Mountain Shaolin Martial Arts Academy from October 2007 through February 2008. It was one of the most enjoyable five months in my life. The training is challenging and the living condition might seem a little bit Spartan to the average westerner, but the opportunity to train with masters who have dedicated their lives to martial arts is invaluable. They are passionate about what they do and enjoy sharing their knowledge with others. Almost everyone has seen a kung fu show and thought it was really cool, but few people spend much time think about all the work and the years of dedication it took to get that good, but the masters here have lived that. The training is challenging but it isn’t excessive. The masters do a good job of tailoring it to meet the needs of the students like anything else in life, you will get out of it however much you put into it, you will definitely leave here in better shape than when you arrived. There are people here of various abilities and ages. When I arrived, I had no martial arts experience. I have greatly improved my strength, flexibility and balance while I still will never be a threat to anyone in a real fight (I haven’t had enough time practicing the moves for them to become instinctive), I feel that I have an excellent base from which to build further martial arts skills. I had and met a lot of great people here and made many memories that I will treasures for a lifetime. If you are unsure if this is for you, I say give it a try. Life is too short not to spend it doing cool things. It is better to fail daring to do great things than to succeed at something you find mind numbingly boring. When I told people back home that I was going to China to study martial arts, many of them thought I was crazy because it was so far to go and the culture so different. However I’ve found my trip to be an amazing experience. As all the students are in the same position as you there is a great sense of camaraderie and they go out of their way to help you settle into academy life. As well as giving you tips of where to shop and go out and useful Chinese phases to use. The training itself is of a high quality , my master, Master Qu was patient and understanding when I got stuck with a move or had questions but at the same time be excepted a high standard and pushed me to achieve it. We were also given the freedom to talk among ourselves during class to discuss moves an help each other. Even in my short time here the school underwent many changes, with improvements to the toilets and showers and the beginning of work on the new training hall. The food however could be better with more variation and balance. The food can also get spread them, as there are many students so there is 6 or 7 people to a table. I’ve learnt a lot in my time here about both martial arts and myself. The most important thing though is that you get out what you put in. if you come with an open mind and a desire to work and learn you will get a lot out of your time here.